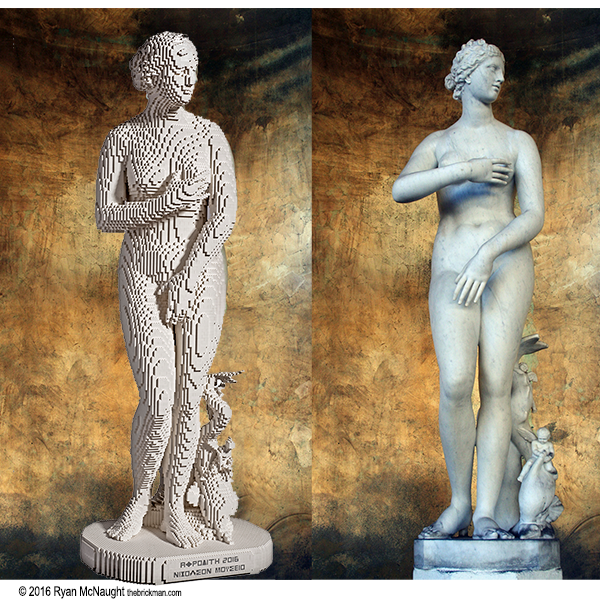 This week we’re going back to early last year for the fourth and most recent model we’ve created for the Nicholson Museum in Sydney- a lifesize LEGO brick version of the iconic Medici Venus statue! The statue’s design has been reproduced by many different artists and sculptures over the centuries, but the Nicholson Museum chose the specific Medici version pictured above for us to base our version on. Apart from getting the curves and expression of the human form right the statue has a host of sea creatures and cherubs around its feet which also had to be sculpted from bricks. Being entirely white made building the complex shapes easier thanks to the much larger palette of parts available in white, but it was still tricky!